View from NE. Digital image of E 16459 CN. Location formerly cited as NS 0864 6852 and centred NS 08640 68528. For (associated) Cobbinshaw Reservoir (centred NT 019 580), see NT05NW 34.00. For footbridge across feeder aqueduct (at NT 08266 68361), see NT06NE 117. For continuation of this aqueduct, as Lin's Mill, Canal Feeder (NT 1058 7056 to NT 1047 7000), see NT17SW 177. This monument comprises a cast-iron trough aqueduct of 25m clear span. Constructed on the arch principal, it is 1.8m wide and has a height of 3.55m at the centre. 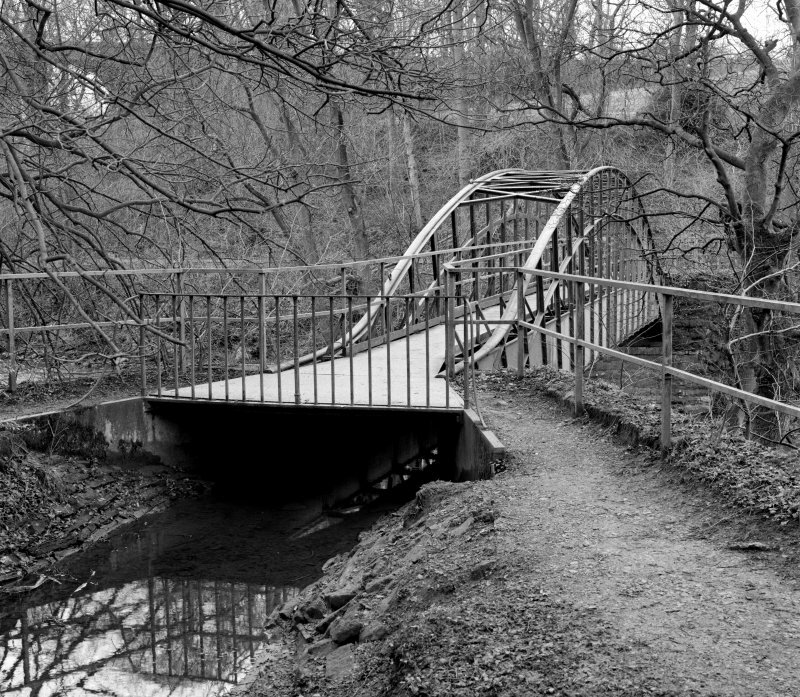 The trough has a cast-iron walkway. It was built c. 1821 to carry the feeder from a weir [NT06NE 32.01] upstream to the Union Canal further to the N.
Information from SDD (HBM), December 1990. 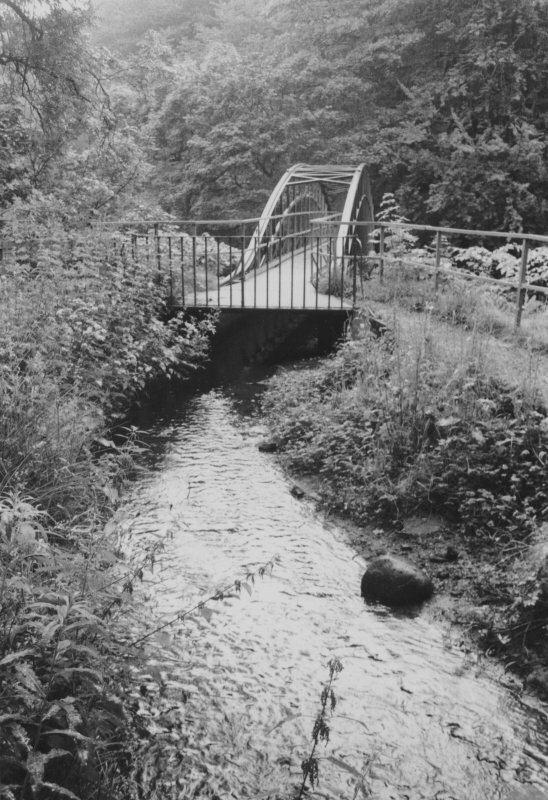 This aqueduct formed part of the main feeder to the Edinburgh and Glasgow Union Canal from Cobbinshaw Reservoir (NT05NW 34.00). It carried water from the N side of the weir NT06NE 32.01 (at NT c. 08248 68386) through the area of Almondell Country Park to NT 08809 68765, where it apparently goes underground. It re-appears as the Lin's Mill Canal Feeder (NT17SW 177), which enters the canal just E of the Almond Aqueduct (NT17SW 47.00). The River Almond here forms the boundary between the parishes of Mid Calder (to the N and W) and Kirknewton (to the SE). The aqueduct runs through portions of both parishes, running along the N bank of the river in its western (upstream) portion and along the S bank further downstream (to the SE). The location assigned to this record defines the midpoint of the span crossing the river. 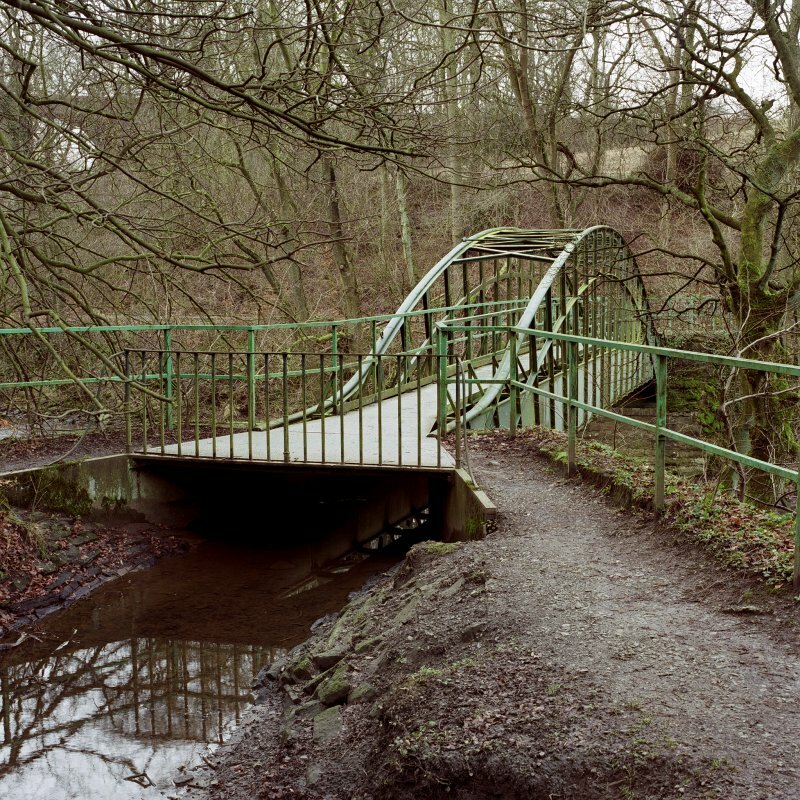 The aqueduct is itself crossed by the Camps railway viaduct (NT06NE 19) and a footbridge (NT06NE 45) within Almondell Country Park, at NT 08599 68426 and NT 08687 68591 respectively. Information from RCAHMS (RJCM), 25 May 2006. Ironfounder Craven, Whitaker and Nowell. Engineer Hugh baird. This aqueduct, erected by May 1822, carries the feeder channel for the Union Canal over the Almond. The trough aqueduct is of cast-iron, 80 ft clear span, 6 ft wideand 11 ft 6 in. high at the centre. The trough is of 0.625 in. thick iron plate with upturned 3 in. flanges across the bottom, and the waterway is 3 ft deep. The cast-iron trough in addition to acting as a beam is also designed to function as a flat arch and there are radiating 3 in. flange joints on the trough side walls. The lines of the flanges when produced meet at a common point below the river bed at mid-span, the radius of the arch being 80 ft. Bearers span across the top flanges of the trough to form a footway. The engineer was Hugh Baird and the ironfounder, Craven, Whitaker & Nowell.